Customer is a renowned name for its car entertainment systems and accessories, specializing in the design and manufacturing of a range of equipment. They planned a system that brings cars diagnostics and Maintenance on the user’s smartphones and facilitated a clear view of fleet to fleet management companies. FINOIT recommended phased approach to meet the requirements of client in developing the whole system. 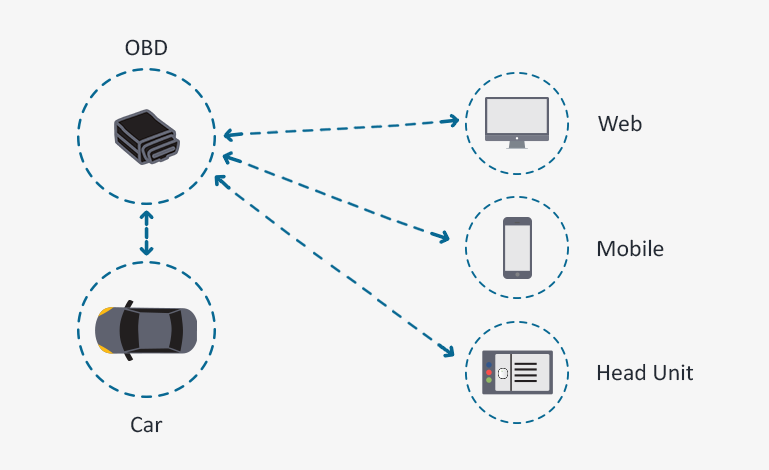 In this project, the data of vehicles is dependent on a hardware called OBD. Once the OBD is installed in vehicles, it sends the data traffic to mobile applications (iOS & android), head unit (if available) and to the admin panel. Another web application manages fleets. This web app is for users who have multiple vehicles and drivers. With this application, users can check the status of vehicles and analytics, driver assigned and vehicle condition. Safety inspectionSafety inspection checks vehicle’s condition and displays result after completing inspection whether vehicle is in good condition or not. If vehicle has any fault, then it would notify about the fault. Maintenance: Maintenance records can be added in list which will further sends reminders for the same. Driving history: Trip history of each trip is recorded and data is saved under this section. User can check the details of each trip from this section. Contact list: List of contacts could also be maintained in the application notifications. A stable and scalable complete car health diagnostic solution leading to improved strategic positioning of customer. Improved vehicle health with early warnings for defects and diagnosis. Improved enterprise wide transparency and performance due to features such as route mapping and tracking and overall fleet management. More sales for customer due to increased satisfaction of their product’s buyers. More acquisition of dealers and distributors.